Red Hill’s annual hop harvest is a longstanding tradition for the Mornington Peninsula brewery. Each year, locals, friends of the brewery and beer fans band together to harvest hop flowers straight off the bines adjacent to the brewhouse for use within a harvest ale. 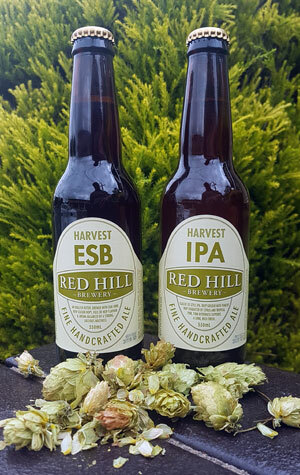 This year, Red Hill decided to give their original harvest ale a sibling, visiting the Yellingbo Hop Farm and returning with a clutch of American hops in order to create two different beers: the returning ESB and a new IPA. The Harvest ESB again features homegrown Willamette and Goldings hops to create a traditional beer with its roots in England. Pouring a deep copper colour, the beer offers up floral, peppery and sweet berry aromas, along with some spice along the way, supported by sweet toffee from the malt body. As for the brewery’s Harvest IPA, it's based around a blend of hops, including fresh Cascade cones from Brad Merritt at Yellingbo. The resulting fresh hop IPA pours a slightly hazy golden colour. There’s plenty of pine alongside mandarin like citrus characters, not to mention some tropical fruit and a light bitterness.